Back in the 1930s, avenues inspired by the luxurious boulevards of Europe became the model leading the planning of Israel’s urban communities and new neighborhoods. Building these broad avenues were designed for residents’ wellbeing, avenues characterized by rows of shade trees, which in recent years were interspersed with seating areas as part of the increasing awareness of the need for shade and the encouragement of walking. 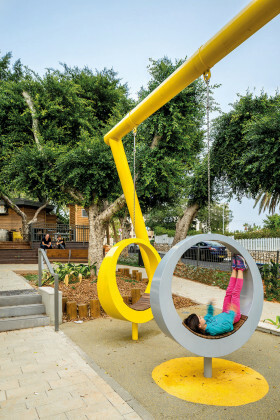 Numerous streets were redesigned to become both a place to rest a while and vibrant meeting places in town. The avenues, restored to their former glory over the past decade, are a model of high quality public space in Israel: spaces for pedestrians and cyclists, shaded with old trees, pleasant all year round, with various types of cafés, offering a variety of options for walking, sitting, and observing passersby, areas with benches as meeting places, and recently also providing a platform for temporary outdoor exhibitions. Amir Avenue (Herzl Avenue) is located in the heart of the city of Hadera – a small avenue built in the 1920s. The ficus trees were planted in 1941 by elementary school students from the Ahad Ha’am School. The street is approximately 160m long and 12m wide, constituting an integral part of the city’s historic core. As part of the renewal of the Hadera city center, the Municipality has defined several focal points for initial intervention: Amir Avenue has been mapped as the central focus, with great potential to transform the look of the city and generate change in the urban fabric. 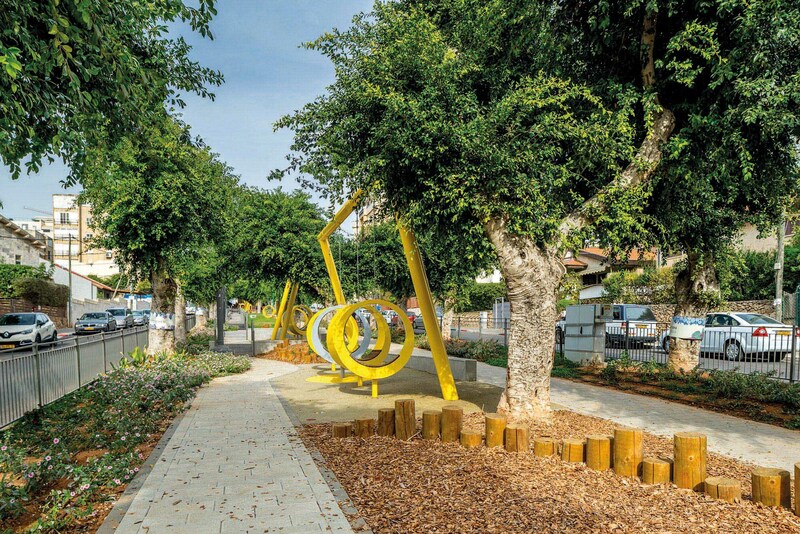 The idea on which the planning is based is the creation of a variation on the historical elements of the avenues, which currently feature three rows of Binyamina ficus trees. However, the central strip of trees is not fully planted. As in the historical avenues, here, too, are strips for walkers located between the rows of tree. One path has steps while the second is graded on an angle enabling accessibility. Differing from the European boulevard tradition, here we sought a different interpretation of the central strip. 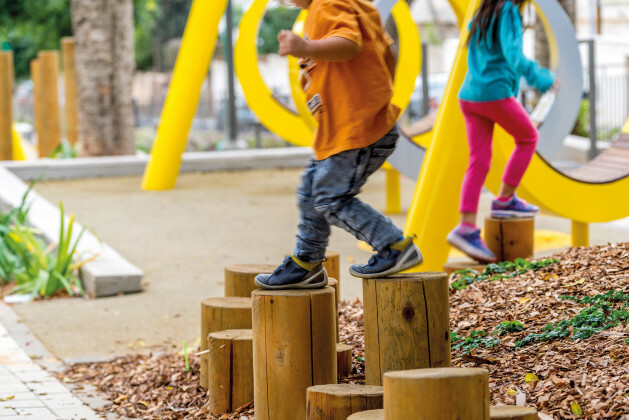 Instead of a gardened area along which seating areas are placed, we decided to transform the middle route into a play environment and meeting place. At the upper part of the avenue, at the junction of Ahad Ha’am Street, the historic kiosk was recently restored. This had been a “mobile” kiosk used by the first settlers. The restored kiosk was built on the pattern of the historic one and is now used as an active community café. The interface between the café and the avenue is also one of the original main streets, mutually enriching activities along the avenue, thanks also to the stairs and seating opportunities we created between them. The design comprises three major strips around the ficus trees: two are for walkers and cyclists, while the central pathway is an activity route. As part of the plan, an additional crosswalk was routed from the center of the avenue to improve connectivity with adjacent streets. 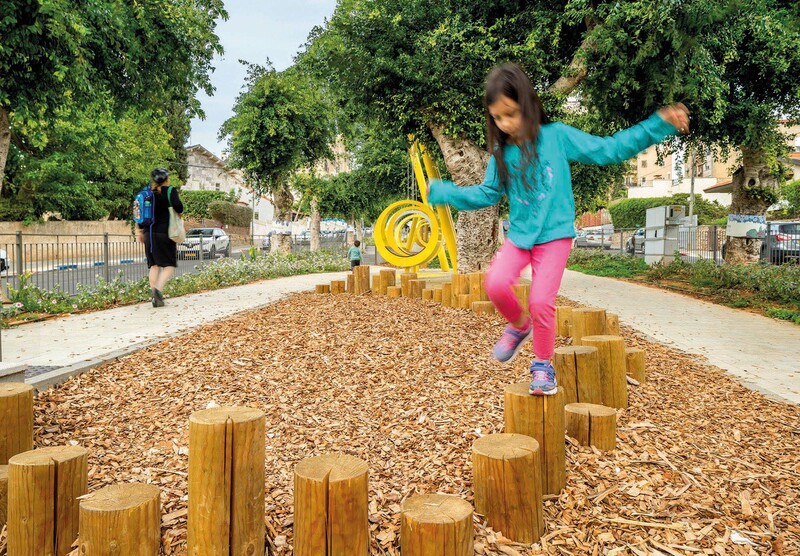 In the central strip we created four informal sculptural seating foci, between them a path stimulating playfulness passing between grassy hills and balancing wooden logs. 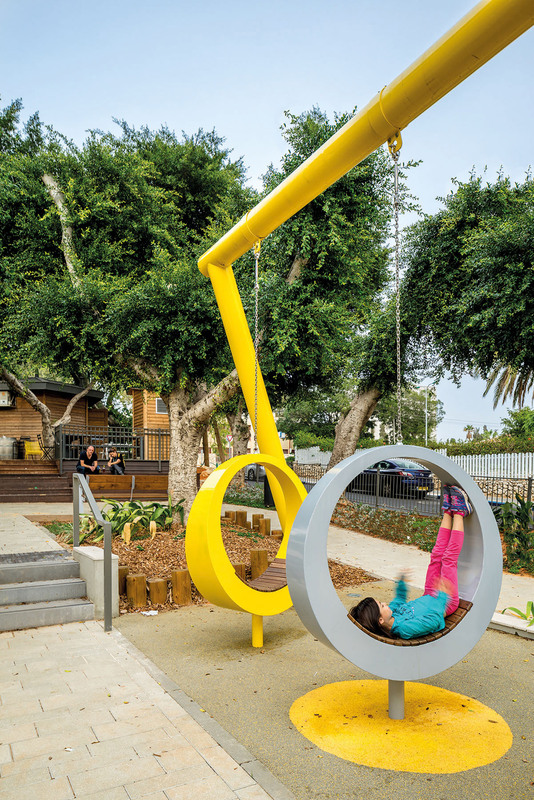 The Yellow Circles, sculptural seating elements, are an additional layer over the traditional boulevard, designed as informal seats enabling sitting, meeting and play, providing an additional unique experience along its length in addition to the rest and walking options. 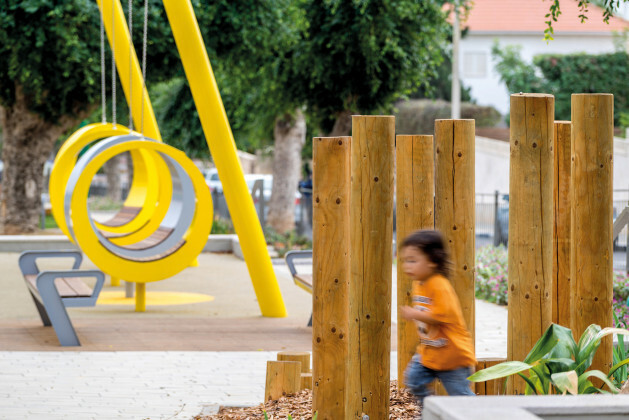 Each seating complex, designed in collaboration with the Lemon Collection Ltd, comprises four round benches connected to a diagonal beam. 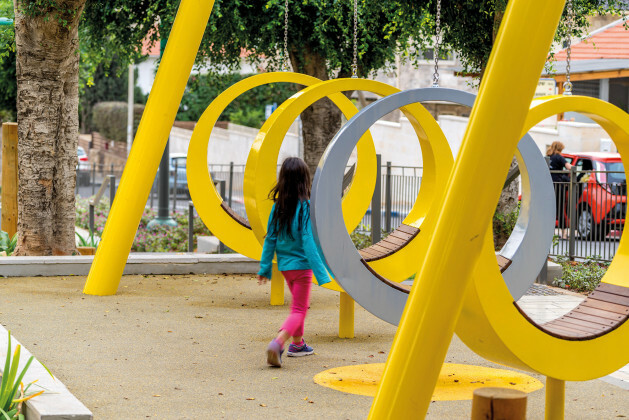 The Yellow Circles enable seating in a variety of formats: one can sit or stretch out inside of a circle, climb over it or walk between the circles. 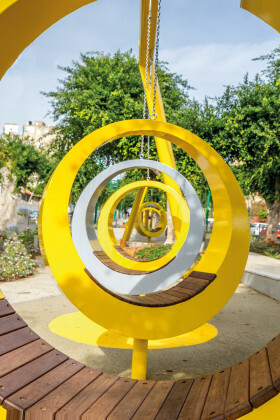 The circles are placed on thin pillars, each at a different angle, all painted yellow and illuminated at night. 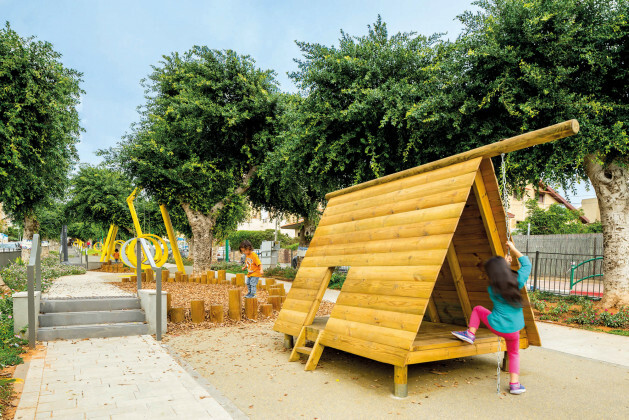 Here we can see that they constitute significant visual placemakers in the heart of the city of Hadera. Another special stratum along the avenue are the wooden play logs dispersed at its center throughout its entire length. Logs and planks for see-saws combined with the hillocks of grass create an experience of play along the avenue. The natural shade from the old ficus trees increase the option of remaining in the place. 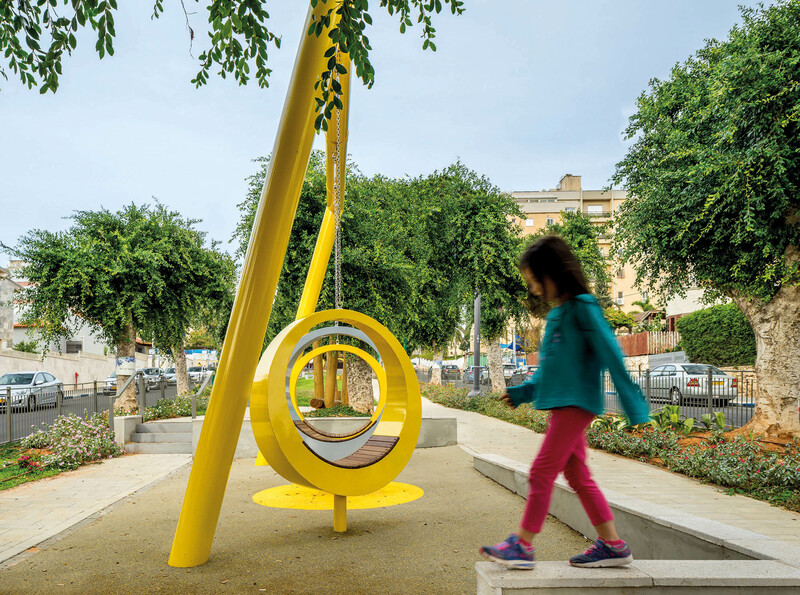 The Yellow Circles and the finish of all elements along the avenue reflect a clean design aesthetic, forming a backdrop to the sculptural character of the sports installations. The paving and walls in the landscaped area are all in shades of light grey, while additional benches creating the seating corners are in wood tones similar to the colors of the seats of the sculptural benches. The vegetation along the avenue comprises three rows of old ficus trees, while the activity strip is characterized by more exposed areas. In the grassy lawns and ground coverings areas, the same logic exists on its margins, characterized by flourishing shade plantings.